The interlaced "gears" in the needlewoven motif are made with Japanese triangle beads in a rich amethyst and in topaz lined with a charming berry colour. 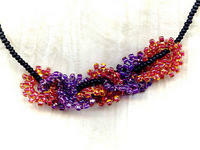 Each of the beads has been individually stitched into place: a painstaking and time-consuming operation, you may be sure! The motif is about 4" long. I've strung it on a 17" strand of matte black seed beads. The clasp is a dainty gold fill hook set. Colouration and styling lend a feel of the art moderne to this lovely creation. It's another innovative design from SPARKLE PLENTY. All of our one of a kind and limited edition artisan beaded jewelry is individually handcrafted in our studio in Los Angeles, California. Be sure to check out our other indie boutique jewelry styles and fashion accessories. Give a unique and unusual gift. 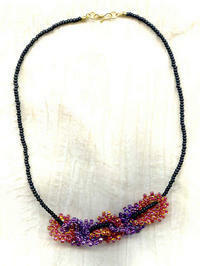 Looking for a bead choker necklace that's a little bit different? The centrepiece is a beautiful amethyst ruffly lampwork bead that's alive with silver foil within the glass.